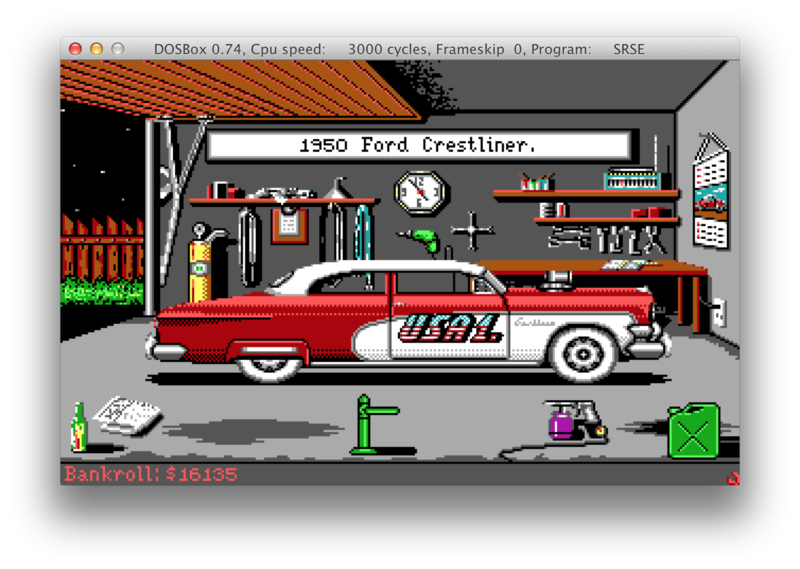 Download and play Street Rod SE for PC DOS now! Choose from 8 brand new stickers. This is Street Rod SE (Special Edition) and features a standard Street Rod version with 25 replacement cars. - Added Street Rod Car Data Disks. - Removed copy protection screen. - Fixed highlighting of the letter 'I' in first splash screen. Luís Vasquez for finding the Data Disks. Tiago Lopes for supplying the splash screen fix. Thanks so much for your work! This is my favorite game from when I was a younger lad. Thanks, its cool to see a classic with some new content. Is the Chevy Styleline cheat in this game as well but with a different car? I haven’t figured that out yet. What I did is create a savegame with the original Street Rod (after using the cheat) and copy it to the Street Rod SE folder, works like a charm. Doesn.t work, even in compatibility mode. Btw, is Street Rod Online back in business now? No, the Street Rod Online project has been put on hold. SWEET! This website is a gold mine. Thank you for all your efforts! Loving this game again. WOW!!!! blast from the past and its updated… amazing!!!!!!!!!!!! Does this replace 25 cars or does it add 25 cars? Whoaa, this is so awesome, and it has the Plymouth Fury in it! Christine, anywone? I missed that car in this game as a child… I thought it would fit well but then again, you never see a Plymouth Fury anywayz, it’s just the whole movie that made me love it, same goes for the DeLorean. You did something really special here Marco! 25 years went by… we all had to miss these extra’s, but you brought it back to life! You’re welcome (: and greetings to all the Tweakers who happen to visit this page. First of all, this is amazing stuff. Hilarious. One question though, is there a way to add the cars, instead of replace them? We played this non-stop in college. However, now I can’t remember the keyboard commands for the actual racing (Gas, shift, brakes, etc). Any help out there. right off hand i thought gas was arrow up and brakes arrow down as was turning L and R arrows. Wasn’t shift the shift key??? HELP!!! Is there a version that works on windows 7 64 bit? My old floppy won’t run it. I can’t believe that people are playing this! That is awesome! I was the original artist that drew all the graphics and every car for the first street rod. I used an Amiga and “painted” pixel by pixel. I can’t even imagine how it might feel to see that SO many people still play this game, every pixel you painted gave us a lot of joy. It has been many years since Street Rod, yet I never felt the same with any game. Nowadays all is about hyper-realistic graphics, physics, sound… but they miss something, and it’s the magic this game made us all feel, from the sparkling stars on the intro to the “Chicken!” when trying to pop the king’s hood, the drive-in and the sleeping guy in the gas station. I’m from south america, and most US movies I saw when I was a child shown me a perspective of the “american dream”, my childish dream was to be one of those guys, tuning a muscle car and going pink slip “all-in” or taking a walk back home if I didn’t have what it takes. You weren’t playing rambo style like in any NFS, you could really feel being that guy, struggling for it. Thanks Judy, thanks for those pixels, for those hours you guys spent making this game. Have never even heard about additional data disks. Played regular street rod for many hours in 90s on PC. Although I don’t feel any difference between this version and the regular one as I’m more enjoying the game mechanics rather than content, I thank you heartly for making this release public! It’s always very exciting to be able to run rare asset-like software, especially if it brings back joyful memories. Hope to see more exciting news regarding this project in the future. Is open source a possibility? I mean, the fanbase would surely be interested in updating and adding to what’s already here. Unfortunatelly the source code of the original game is lost. Adding new cars is not much important thing for this game. Game is too easy, that`s the main problem. After 15 minutes of playing I already have fastest car and then game became boring. Better choice would be to mod Street Rod 2. Is there a way that the original cars could be added instead of replacing the original ones? At this point it’s not SR1 but rather SR1.5. I’m not complaining about having new cars but for people who want to play the original street rod this doesn’t seem like the best option. I will enjoy this tho, it will be nice to have no idea what is the best for an hour or 2…lol I would recommend playing the originals on WinUAE tho if you want to play them. They look better and have all the cars you are used to. I have a MAC operating on osx 10.7.5, cannot figure out how to download it to make it work. Is it even possible?? Download DOSBox for OS X and run it from there. Get Boxer (http://boxerapp.com/) and play (almost) every DOS game you want on a Mac. Whooops! found an oopsie on it! If you try to play it in hercules emulation mode (just for the fun of it, as when I was young that was what I had) the cars won’t be shown properly. I had to rename my files, so the easiest way is to make a new file in your game file, I named my SRSE, then when you download the content drag it into your SRSE file, you see an icon marked application under the classification type (means what type of file it is), this is the game itself, rename it to whatever you like I named mine SR, because as mentioned in Street Rod 1 and 2 the application is named SR…(note: when you drag these files into the SRSE file make sure they are not in another file!!!! you only need the main file everything else must be lose in able for this to work….hope that makes some sense…so when you type in your commands it will be mount c: c:\games (that will open your game file), then type c: (that will tell it to search for the c drive), then type cd srse (that tells it to open the fill srse), then type SR (or whatever you named your application, this will load/launch the game)…hope this helps, Ive used this process for other games as well like DOOM, it works very very well!